I love expanding my crochet and knit skills, and something that I have never tackled before is knit lace! Knit lace has such an intricate and elegant look and appeared very daunting whenever I encountered it in stitch books or online designs. My friend Vanessa of VanessaKnits has been a loyal supporter of my work and graciously offered to send me her original pattern with accompanying yarn to help me dip my toes in the world of knit lace. She knew it would be a fun challenge for me and that her design would be my style! 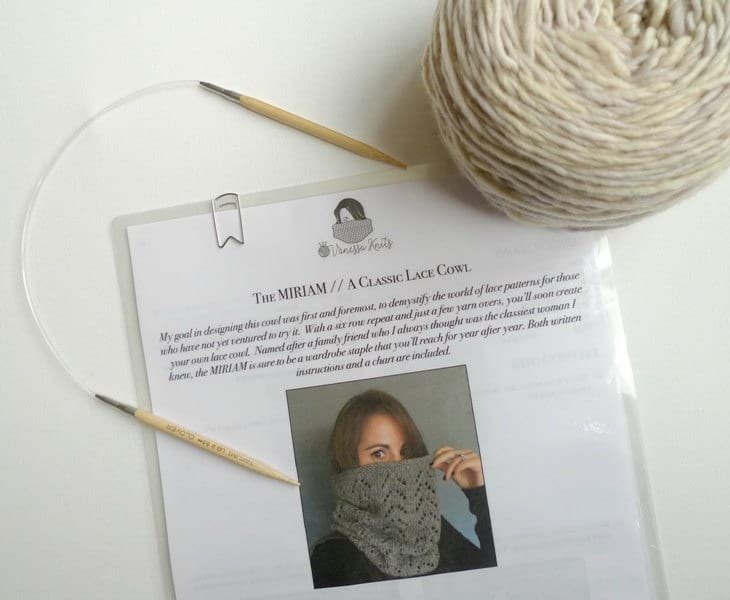 The Miriam (pattern found HERE) is a classic lace cowl and as Vanessa writes, “My goal in designing this cowl was first and foremost, to demystify the world of lace patterns for those who have not yet ventured to try it. 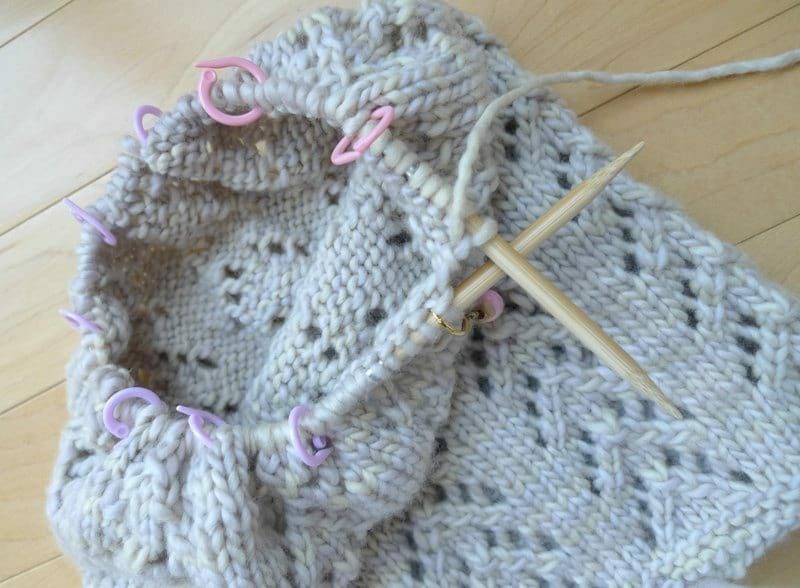 With a six row repeat and just a few yarn overs, you’ll soon create your own lace cowl. Named after a family friend who I always thought was the classiest woman I knew, the Miriam is sure to be a wardrobe staple that you’ll reach for year after year. 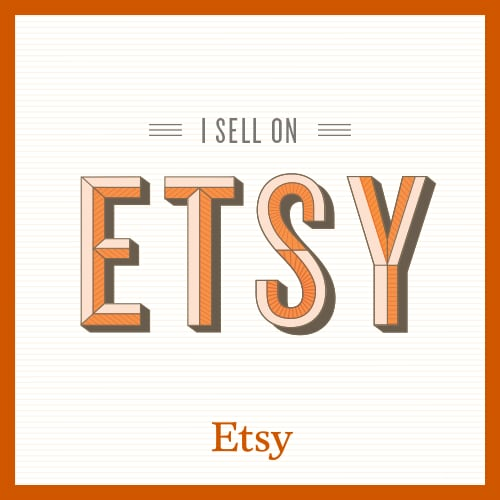 Both written instructions and a chart are included.” Vanessa even laminated her pattern for me, which is brilliant since my printed out patterns are always getting torn, wrinkled and stained as I transport them everywhere I go! The Miriam Cowl uses worsted weight yarn, and Vanessa sent me this gorgeous “Manos Maxima” 100% Extrafine Merino Wool by Manos del Uruguay in the color “Sand”. 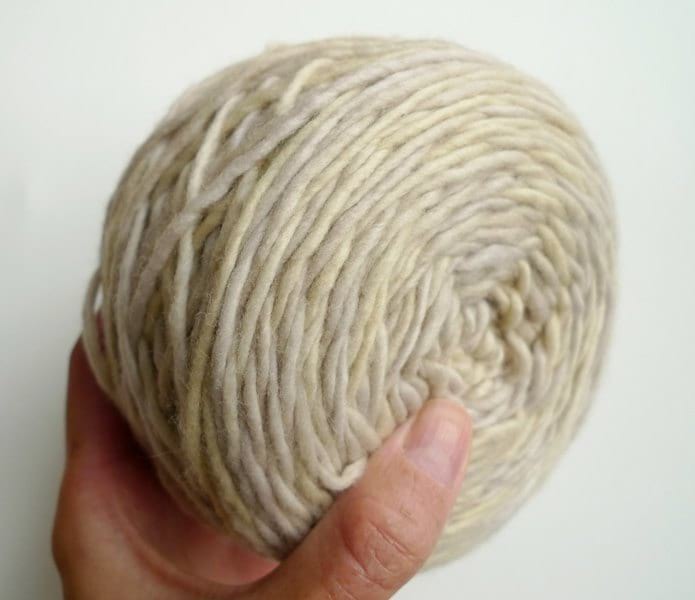 It was my first time working with this yarn, and as stated on the label, “Manos del Uruguay is a non profit organization which assembles over 400 artisans in cooperatives scattered throughout the countryside of Uruguay. The aim of the organization is to bring economic and social opportunities to rural women.” What a neat organization! After carefully reading through Vanessa’s pattern notes complete with helpful step-by-step photos, I dove right into the pattern! I made sure to work on this design when I could be fully concentrated (not at the same time as watching tv or if the girls were near me needing help haha). I repeated the stitches and steps in my mind as I did not want to make any mistakes and have to frog my work! It was incredibly satisfying going through each repeat and seeing the beautiful lace build up. As Vanessa recommends, placing stitch markers throughout the work really helps to keep track of when the stitch pattern changes! This was very helpful in ensuring that I was doing the correct number of stitches and that I wasn’t accidentally missing any steps. I was so proud to cast off the cowl and block it for a smoother finish and greater lace stitch definition as recommended by Vanessa! Here is my finished Miriam Cowl! Isn’t it so luxurious and elegant? It looks more complicated than it is! Once you get the hang of the pattern and know how to work yarn overs, you get into the rhythm of this design. 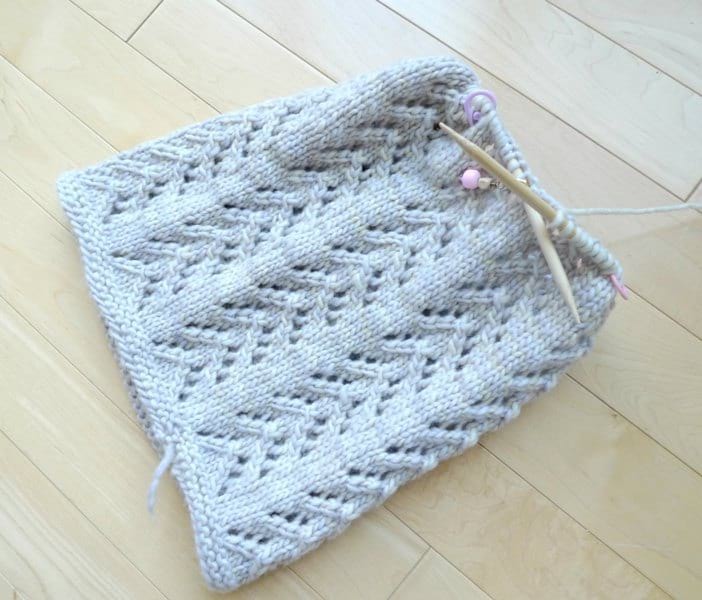 I love the delicate and intricate look of this pretty cowl. Knit lace is so beautiful! The cowl keeps your neck warm and can also shield your face from the cold wind if you pull it all the way up. 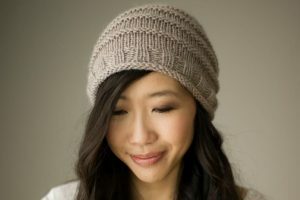 I love the height of the cowl and its versatility since it can be scrunched down or straight up! This is the perfect cowl to slip on during a brisk day as it can fit under a jacket or be worn as a statement piece over a jacket! This cowl will be a staple in my wardrobe, especially given its neutral color that will match with everything (Vanessa knows my color preferences well haha). Doesn’t the Miriam Cowl look gorgeous paired with my blush pink jacket? I’ve worn my Miriam Cowl many times this week already and I absolutely love it! If you have been wanting to try your hand at knit lace, I highly recommend the Miriam Cowl by VanessaKnits- the pattern can be found HERE! Vanessa is such a talented designer and mama who is so supportive within the crochet and knit community. I am so thankful that I could collaborate with Vanessa and work through one of her designs! 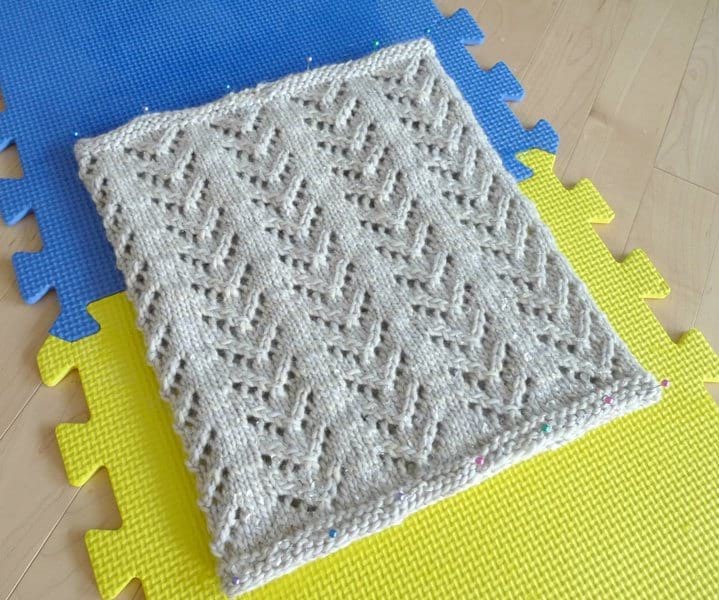 Her pattern was so clear and easy to follow and such a great way to learn a new skill. Vanessa and I are partnering together for a GIVEAWAY so that THREE of you will win a VanessaKnits original pattern! 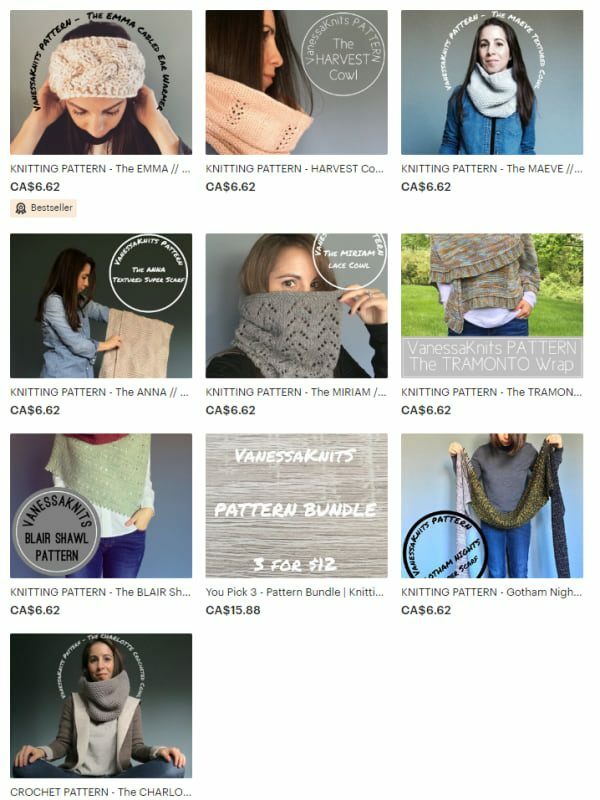 To enter the giveaway, take a look at Vanessa’s designs HERE and let us know in the comments below which one you would love to win (Vanessa has cowls, wraps, earwarmers, and scarves in her shop)! This giveaway is open WORLDWIDE and will close on Sunday, October 7th at 8 PM MST. You can also enter on Instagram and Facebook for more chances to win- one winner will be chosen from each platform! You can follow Vanessa on Instagram, Facebook, and her website HERE to keep up to date with her work! Note: Thank you to Vanessa for sending me the Miriam Cowl Pattern and the Manos del Uruguay yarn! All opinions expressed are 100% my own!